Aim ― Meta-analysis of clinical trials comparing the efficacy of medical therapy (MT) and surgical treatment, including cardiac resynchronization therapy with and without cardioversion-defibrillation (CRT and CRT-D), circulatory support system (CSS) and heart transplantation (HT), in terms of decreasing overall mortality in patients with severe chronic heart failure (CHF). Material and Methods ― Meta-analysis included 39 clinical trials with a total number of 30,257 patients. Search was performed in MEDLINE, Medscape, Pubmed databases and on web resources, dedicated to clinical trials (National Institutes of Health, Clinical Center, ClinicalStudyResults.org, ClinicalTrials.gov). Results ― There was no significant overall mortality reduction in patients receiving MT when compared to control group: OR=0.97 (95% CI: 0.85-1.10), p=0.211. Treatment with CRT and CRT-D, as well as CSS implantation and HT reduced overall mortality: OR=0.67 (95% CI: 0.57–0.79), p < 0.001 for CRT/CRT-D and OR=0.46 (95% CI: 0.24–0.86), p = 0.018 for CSS/HT. Conclusion ― Superiority of surgical treatment over traditional MT in terms of overall mortality was observed in patients with severe CHF. Kotsoeva OT. Comparison of impact of medical therapy and surgical treatment on overall mortality in patients with severe chronic heart failure: a meta-analysis. Russian Open Medical Journal 2016; 5: e0304. In the last decades problem of choosing how to manage patients with chronic heart failure (CHF) is becoming more and more relevant, because new approaches to this condition are being developed and included in clinical guidelines [1-5]. Standard models of organizing care for patients with CHF are also being developed , methods of evaluating its quality and efficacy are being perfected  and CHF registries are created [8-14]. Researchers turn their attention to different aspects of CHF: from influence of low-intensity electromagnetic fields on endothelium function  and genetic determinants of CHF  to vegetative  and cognitive dysfunction . Defining optimal treatment for patients with severe CHF to improve their short-term and long-term prognosis remains an unsolved problem for modern cardiology and cardiac surgery, as condition of many patients worsens even while receiving medical therapy (MT). This fact has stimulated the development of surgical techniques for management of severe CHF, such as cardiac resynchronization therapy (CRT), cardiac resynchronization therapy combined with cardioversion-defibrillation (CRT-D), circulatory support system implantation (CSS) and heart transplantation (HT), which have their efficacy already proven [19-24]. Earlier we have conducted a five year prospective clinical trial to evaluate long-term results of medical and surgical treatment in 90 patients with New York Heart Association (NYHA) functional class III-IV of CHF, who have received treatment in A.N. Bakoulev Scientific Center for Cardiovascular Surgery in 2007 . Advantage of surgical treatment over traditional MT in setting of severe CHF was shown. Despite great interest towards surgical and medical management of severe CHF, we found no comparative meta-analyses on this topic in available literature. Aim of this study was to perform a meta-analysis of major clinical trials which compared the efficacy of MT and surgical treatment (CRT, CRT-D, CSS and HT) of patients with severe CHF. The meta-analysis included 39 clinical trials [25-67] with a total number of 30257 patients. Search was performed in MEDLINE, Medscape, Pubmed databases and on web resources, dedicated to clinical trials (National Institutes of Health, Clinical Center, ClinicalStudyResults.org, ClinicalTrials.gov). Following keywords were used during the search: “heart failure”, “ventricular dysfunction”, “cardiac resynchronization therapy”, “heart transplantation”, “mechanical assist devices”, “LVAD”, “randomized controlled trial”, “congestive heart failure”, “biventricular pacing,” “chronic cardiac failure resynchronization therapy,” “Medtronic,” “InSync,” “Guidant,” “St. Jude,” “implantable defibrillators,” “ICD,” “single chamber ICD,” “dual chamber ICD,” “congestive heart failure,” “CHF,” “chronic heart failure,” “biventricular assist device implantation”, “continuous-flow LVAD”, “ambulatory pts with HF”, “quality of life”, “exercise capacity”, “peak oxygen consumption”, “controlled clinical trial,” “meta-analysis”. trials which included data on overall mortality. Exclusion criteria for trials: conference reports, clinical cases, case series, expert reports and opinions. Twenty seven trials were dedicated to analysis of MT efficacy (Table 1). This group included 7 trials which evaluated the impact of using β-blockers [32, 35, 37, 39, 42, 45, 47], one trial which evaluated usage of aldosterone receptor blockers (AldRBs) , 5 trials which evaluated angiotensin-converting enzyme inhibitors (ACEIs) [26, 27, 30, 40], 2 trials on effects of angiotensin receptor blockers (AngRBs) [38, 46], 3 trials on effects of calcium channel blockers (CCBs) [28, 29, 41, 56, 67], 7 trials which evaluated effects of phosphodiesterase-3 inhibitors (PDEIs) [31, 33, 36, 43, 44, 62, 64], one trial on direct renin inhibitors (DRIs)  and one trial on vasodilator usage . ACEIs, angiotensin-converting enzyme inhibitors; AldRBs, aldosterone receptor blockers; AngRBs, angiotensin receptor blockers; CCBs, calcium channel blockers; DRIs, direct renin inhibitors; PDEIs, phosphodiesterase-3 inhibitors. Thirteen trials described the effect of CRT in patients with severe CHF (Table 2). Seven trials evaluated efficacy of CRT only [48, 50-52, 57, 58, 60, 63, 65]. One trial  compared efficacy of cardiac resynchronization therapy combined with cardioversion-defibrillation (CRT-D) and efficacy of cardioversion-defibrillation only. Two trials compared efficacy of CRT-D with no resynchronization therapy [55, 61]. COMPANION (CRT vs MT) trial [55, 59] evaluated CRT with optimal MT. One trial (Kotsoeva-Bockeria) [24, 25] evaluated efficacy of CRT and CRT-D compared with MT in patients with severe CHF. CRT, cardiac resynchronization therapy; CRT-D, cardiac resynchronization therapy combined with cardioversion-defibrillation; CVDF, cardioversion-defibrillation; MT, medical therapy; non-CRT, patients without cardiac resynchronization therapy. 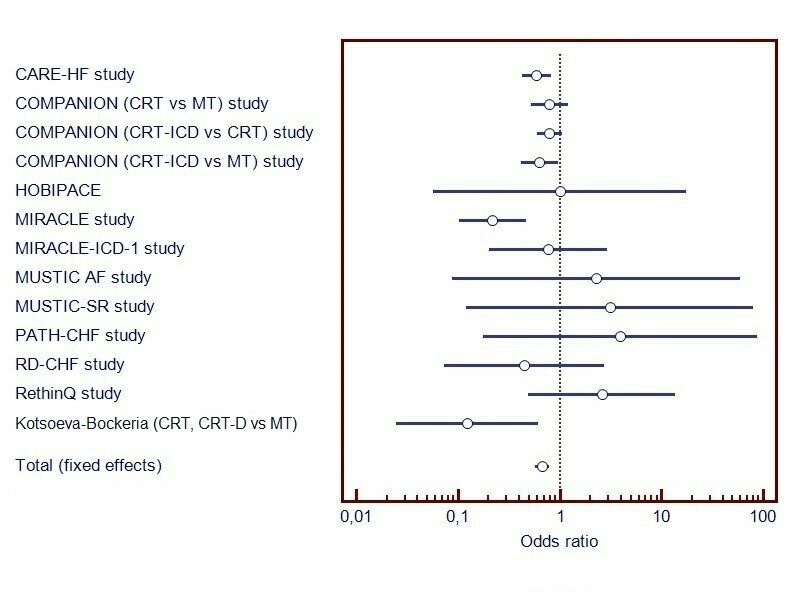 Also, meta-analysis included 2 trials on evaluation of efficacy and safety of surgical treatment for terminal CHF: REMATCH study  and Kotsoeva-Bockeria study (CSS, HT vs MT) [25, 68]. In these trials efficacy and safety of CSS usage, orthotopic HT and MT in patiens with NYHA class III-IV CHF were compared. Meta-analysis was performed using Meta-analysis Comprehensive V.2.0 software (Biostat Inc., USA). In cases of insignificant statistical heterogeneity in trials (I2 <50%) the analysis was performed using fixed effects model. High statistical heterogeneity (I2 >50%) required us to use random effects model. Treatment effects were evaluated by calculating odds ratio (OR) and 95% confidence interval (95% CI). Meta-analysis of overall mortality in patients with severe CHF was performed by each treatment type (Table 3). There was no significant decrease of overall mortality risk in patients who received MT when compared to control group: OR=0.97 (95% CI: 0.85-1.10), p=0.211 (Figure 1a). Treatment of patients with severe CHF using CRT and CRT-D and also by CSS implantation and HT significantly decreased overall mortality: OR=0.67 (95% CI: 0.57–0.79), p<0.001 (Figure 1b) for CRT/CRT-D and OR=0.46 (95% CI: 0.24–0.86), p=0.018 (Figure 1c) for CSS/HT. No significant difference was onserved between CRT/CRT-D and CSS/HT in terms of overall mortality decrease. CRT, cardiac resynchronization therapy; CSS, circulatory support system; HT, heart transplantation; MT, medical therapy. Figure 1. A metagraph of overall mortality in patients with severe CHF on MT (a), CRT / CRT-D (b) and CSS usage / after HT (c) compared to control group. Left column shows names of the trials (brief description of trials is given in Tables 1, 2 and text). «Total» – total evaluation of odds ratios. 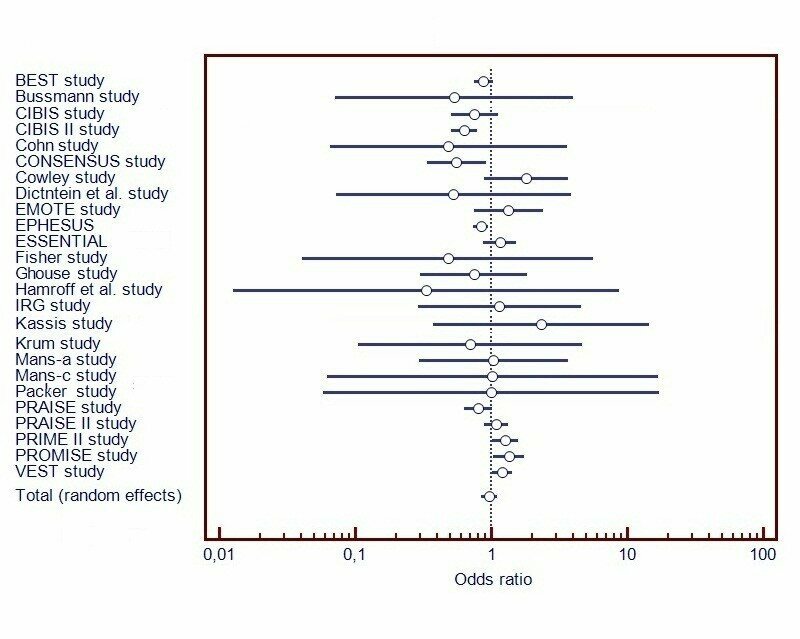 Results obtained in this meta-analysis complement existing knowledge on value of various options of surgical treatment for severe CHF. Evidence on a certain degree of superiority of surgical management over traditional MT in terms of decrease in overall mortality was gained. CRT is studied most comprehensively of all surgical options. It is known that effect of CRT is pathogenetically based on its influence on interventricular dyssynchrony, which elevates personal risk level in patients with severe CHF . Meta-analysis of CRT and CRT-D efficacy in patients with CHF is known, where it was demonstrated that CRT decreases overall mortality and hospitalization rate due to CHF, irrespective of NYHA class . However, patients with I-II NYHA class CHF had too many adverse events, so is is advised to use CRT only for III-IV NYHA class patients . It is important to note that CRT is seen by some authors as a temporary alternative solution for patients who will inevitably require transplantation [71, 72]. CSS implantation allows to improve quality of life of patients with severe CHF for a prolonged period, which is especially important for those who are in line for HT. M.S. Slaughter et al. have demonstrated a relative safety of modern CSS in terms of stroke risk. A relatively favorable prognosis in patients with severe CHF with active CSS is confirmed by several literature reviews . HT surgery is also a treatment of choice for selected patients with terminal CHF, especially when other options fail. Of course, HT is unable to radically change the situation with CHF on a population level . It is out of the question that clinical decision making and personal risk evaluation for surgical management of severe CHF should be done with consideration of other risk factors, already well studied for cardiosurgical patients [76-80]. Of all trials included in this meta-analysis, none evaluated gender-specific effects of treating severe CHF on long-term prognosis. This problem requires thorough research in the future, with results by S. Zabarovskaja et al. taken into account , which provide evidence of lower long-term mortality in women who were treated with CRT when compared to men. An important limitation of this study was small number of trials on HT included for analysis. 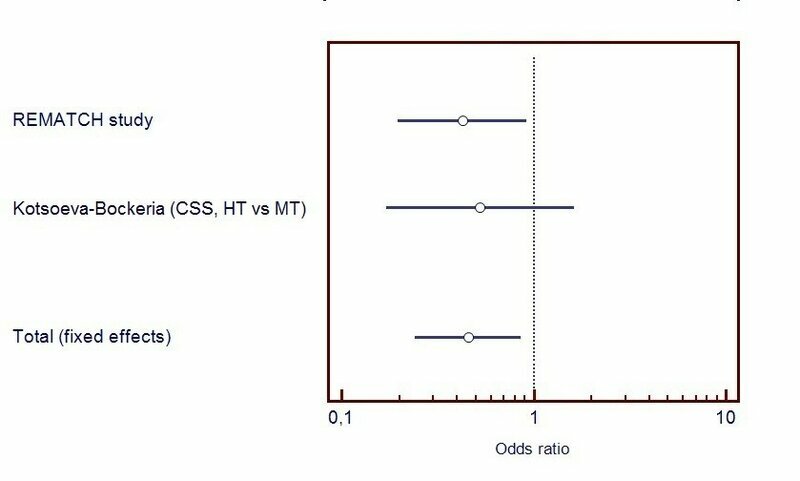 Primarily, this meta-analysis has demonstrated the advantages of surgical options for treatment of severe CHF (such as CRT, CRT-D, CSS and HT) over traditional MT in terms of decrease of overall mortality. Leclerq C, Cazeau S, Lellouche D, et al. Upgrading from right ventricular pacing to biventricular pacing in previously paced patients with advanced heart failure: a randomized controlled study. Eur Heart J 2003; 24(Suppl. Aug/Sept): 364A. Olanna T. Kotsoeva – MD, PhD, Head of Department of Medical Rehabilitation, North-Caucasian Multidisciplinary Medical Center, Beslan, Russia.